Can you believe it is December already? Where has the time gone? It seems like just yesterday we were starting school and getting ready for Halloween. Either way, I love Christmas. I love the smells, the colors, the sounds, all of it. 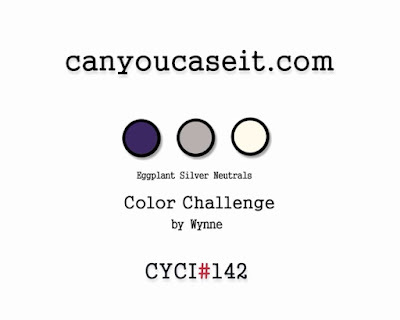 Today, we have a color challenge for you at Can You Case It? The more I looked at these colors, the more I liked them. I started the card with a piece of Whip Cream and Pretty Pansy cardstock. Next, I took a piece of Whip Cream cardstock and stamped the Snow burst snowflakes with Clear Pigment Ink. I then took Silver PanPastel and rubbed over the top. Tada! I beautiful, silvery background. 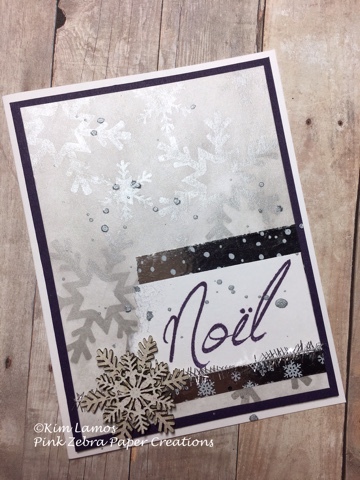 Next, I took a piece a strip of Whip Cream Cardstock and stamped the Noel from Noel Chirp in Pretty Pansy ink. I tore the end off of the strip and adhered it to the card. I then took some silver washi tape I had in my stash, on either side of the sentiment. Then, I wrapped a piece of Tinsel Trim around the card and adhered the layer to the card base. To finish the card, I splattered some Silver Silk to the card and added a wooden snowflake to the bottom. Enjoy! Ooooh, I love the silver shine in your background! And the wooden snowflake is just perfect! The tinsel trim and the washi make this card so fun! I really like this!